The summer music festival scene has quickly gone from a beacon of counterculture DIY craftsmanship, to mindlessly pumping bass cabs, corporate stages sponsored by Doritos and Taco Bell, over-hyped holographic performers and heavily filtered Instagram photos of bikini clad girls in native American headdresses. Wildwood Music Festival is not that kind of festival. Located in the remote coastal foothills, at the edge of wine country is the little-known Willamina, Oregon (pronounced Will-a-MINE-a) that hosts the yearly roots and Americana music festival. "There have been tourist maps made by our county that don't have our name on it," explained co-founder of the festival and owner of the Wildwood Hotel, Katie Kendall. With the help of her sister Meredith and the owner of the Roshambo ArtFarm, Kim Hamblin, Wildwood has been an annual affair for three years. The Roshambo ArtFarm in an ancient basalt rock quarry at the edge of a hay field that is transformed into a one-stage paradise for underground roots musicians and fans. The caliber of artists is unmatched for a DIY festival of its size (about 850 attendees between concertgoers, musicians and volunteers in 2013). 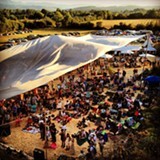 The festival started out with a secret booking of legendary roots musician Charlie Parr in 2011, one that the organizers had to keep secret because of Parr's contract to play the Pickathon music festival just prior to arriving in Willamina. Using only word of mouth, Kendall said about 300 people attended the show, and that they haven't looked back since. "To say we started it on a shoestring is exaggerating," said Kendall. "We started it with nothing. There are so many underappreciated bands in that genre. It's tapping into this iconic thing that is America itself. I love that part of it." This year's festival is headlined by Bend's own Larry and His Flask. The 20-plus band lineup includes other underground roots phenoms like song crafter Willy Tea Taylor, and stomp-rockers Hillstomp. In the same family, but not booked at Wildwood is Konrad Wert, who goers by the stage name Possessed by Paul James, and is scheduled to play Pickathon just a few weeks after Wildwood. At his recent show in Bend he described his cohort of folk musicians as, "Lizards under a cool rock in the shade," a group below the popular radar that tours frequently, lives frugally and are fueled by an undeniable passion for their craft. 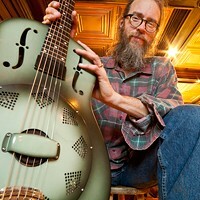 "It's a lifestyle," said Charlie Parr. "It never occurred to me to try to play music that people liked. It only occurred to me to play what I wanted to play, because I'll play it in the kitchen if people listen to it or not. My agent asked me what my goals are. I said it's the same as it's always been, I want to do tomorrow what I did today again. I have everything I want. I'm completely satisfied. I'm happy to be that lizard." This will be Parr's third year in the rock quarry, and despite a happy home in Duluth, Minn., where he is considered a state treasure, Parr said Oregon could easily be a second home. "I love Willamina, it's an amazing little spot," he said with a twinge of nostalgia in his voice. "If I didn't live in the place I live and love it so much, I think I'd probably live there."